We are on the cusp of a sweeping revolution––one that will change every facet of our lives. The changes ahead will challenge and alter fundamental concepts such as national identity, human rights, money and markets. In this pivotal, complicated moment, what are the great questions we need to ask to navigate our way forward? 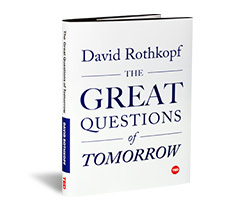 David Rothkopf believes in the power of questions. When sweeping changes have occurred in history—the religious awakenings of the Reformation; the scientific advances of the Age of Exploration; the technological developments of the Renaissance, the Enlightenment, and the Industrial Revolution—they have brought with them, not just new knowledge, but provoked great questions about how we must live. With the world at the threshold of profound change, Rothkopf seeks the important questions of our time—ones that will remake the world and our understanding of it. From the foundational questions: "Why do we live within a society?" and "What is war?" to modern concerns such as "Is access to the internet a basic human right?" 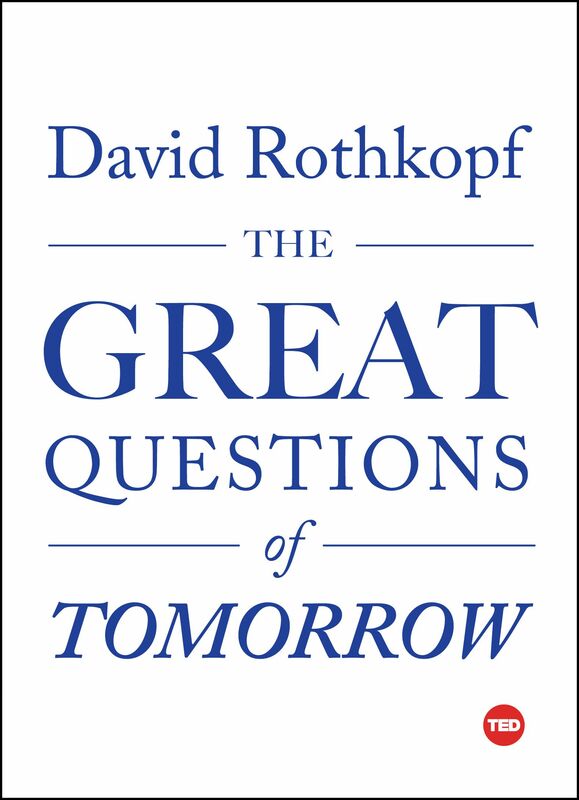 The Great Questions of Tomorrow confronts our approach to the future and forces us to reimagine fundamental aspects of our lives––identity, economics, technology, government, war and peace. Listen to an interview on Slate's The Gist podcast : Are We Smart Enough to Be a Direct Democracy? David J. Rothkopf is CEO and editor of the FP Group, which publishes Foreign Policy magazine and the foreignpolicy.com website, presents FP Events worldwide, and produces research through FP Analytics. He is also the host of The Editor’s Roundtable podcast. David is a widely published author and has written numerous books, including most recently National Insecurity: American Leadership in an Age of Fear, as well as Power, Inc., Superclass, and Running the World, and has given a TED Talk on how fear drives American politics. He is a visiting professor of international and public affairs at Columbia University's School of International and Public Affairs and a visiting scholar at the Carnegie Endowment for International Peace.